Ah, Malibu, California. A land of endless summer, where twenty-seven miles of ancient rocky coastline collide with crystalline ocean. Where rock-hard beach boys and beautiful surfer girls ride the waves just moments away from hillside manors of the rich and famous. Home of elite equestrian clubs, five-star detox resorts… and fine, European-style chocolate. If that last item came as a surprise to you, you’re not alone. Malibu is, after all, starlet territory, and as we all know the it-girls around these parts prefer to subsist on water, air and salad. Thus, it was through pure luck and coincidence that, on my way toward a non-candy related venture in Oxnard, I discovered the splendid K Chocolatier by Diane Kron. Nestled into a tiny berth in an upscale shopping plaza, K didn’t immediately catch my attention. Yet, as it tends to, the word “Chocolatier” popped out at me as I walked by. Drawing closer, my eyes were drawn to an announcement beneath the store’s name: “As seen on the Food Network.” Chocolate? Featured on the Food Network, and called the “Rolls Royce of Chocolate” at that? I needed to investigate further, so in I strode. Upon entry, it becomes clear K is no run-of-the-mill chocolate shop. While small in size, the space K does have is put to good use. Shelves are stocked with all manner of packaged goods; most wrapped in gold or silver paper or accentuated with sprightly threads of ribbon. Amid the chocolate and truffle variety boxes, I immediately noticed the Hungarian Drinking Chocolate. Sold in a clear canister, the curls of pure European chocolate look made for milk or a cup of strong coffee. That was in New York City, which the Hungarian-American family called home during the reign of their renowned Kron Chocolatier shops. The Krons amassed an impressive list of customers including Jacqueline Kennedy and Andy Warhol. They sold their business in 1983, aiming to take some time off in order to raise their children. This philosophy seems to be paying off. 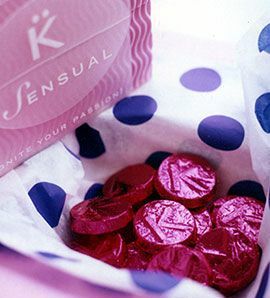 K Chocolatier has a fiercely loyal base of customers, many of whom journey great distances in their quest for chocolate. When JuDee and Michael Santomauro first discovered the chocolates, they were living in the Bay Area, which made frequent trips impossible. Since then, however, they’ve relocated to Valencia – it’s still a forty-minute drive, but, according to the Santomauros, well worth it. As luck would have it, there was a sample bowl of the much-loved truffles on the counter when I visited. Elie invited me to try one. I took one of the cocoa-dusted balls and bit. The flavor is immediately striking. What first hits your palate is a blast of unsweetened cocoa dust, intense, bitter… almost coffee-like. After a few seconds, this recedes and your taste buds collide with a sweeter dark chocolate shell. As this half-melts and half-breaks, you are greeted by the creamy dark chocolate center of the truffle. Ultra-rich, buttery, and sweet yet unapologetically dark chocolate, the center is enhanced by an unmistakable hit of rum. Though based on a Hungarian recipe, these remind me of imported French truffles I’ve tasted. The best word I can think of to describe these truffles is “transcendent.” I simply needed more. Two days later, I’m still craving the cocoa dusted balls. I have no choice but to award K’s Rum Truffles my very first CandyAddict.com Awesomely Addictive Candy Award! 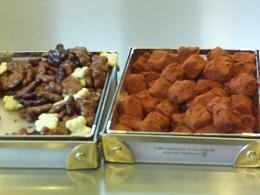 Also available for sampling were Diane’s signature “K Bears,” which happen to be Elie’s favorite. Adorable beyond belief, these little teddy-bear shaped treats are sweetened rice crisps covered in milk, dark and white chocolate. I tasted those as well, and was very impressed – I was reminded of chocolate-coated Cocoa Krispies. In my opinion, the K Bears weren’t on the same level as the Rum Truffles – but I can see how they might become addictive. I left K Chocolatier by Diane Kron with six extra Rum Truffles and an eagerness to share the store and the Kron family’s story with the readers of Candy Addict. I’m thrilled to have discovered this local gem. At this point, Diane’s creations are only available through in-person stops at one of her two stores. 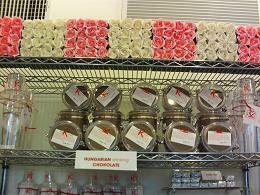 But if you live in Southern California or find yourself visiting, and enjoy great chocolate, you owe yourself a visit.